It is a time-honored tradition of yearly commitment to change – the New Year’s Resolution. We sit down and make a decision that this year we will begin a regular exercise program or new diet. Or perhaps we will quit smoking or spend more time with our children. Why is it that when we make these ‘resolute’ decisions, so many of these annual promises rarely last? When we resolve each year, what we are really looking for is ‘a dramatic and far-reaching change’. What we seek is a New Year’s REVOLUTION. Often our New Year’s resolutions ‘revolve’ around actions we want to take or habits we want to change. The focus is always on the action – the Doing. To create a dramatic and far-reaching change, we must first understand that all of our actions come from what we are thinking and more importantly, who we are being. It is a common belief that ‘when I do this…then I will have that…and then I will be happy.’ For example, if I work real hard, I will have lots of money and then I will be happy. The truth is true success and happiness occur in the reverse. When you are happy with an attitude of success …you will do the things that will bring you all you desire. The being always precedes the doing and the having. To create your New Year’s Revolution, you must first decide what you want, and then, more importantly, determine why you want it. Ask yourself why you want to exercise or go on a diet. Is it to lose weight? Is it to get in shape? But why do you want that? With each answer to why, keep asking why. Dig deeper. Ultimately, you will find that the answer will always lead to a state of being…to be stronger…to be freer…to be happy. Would you like to know a secret? Come closer…you do not have to do anything to be happy! All you need is to change your focus and decide to be happy. Ultimately, this is the decision that needs to be made…to be happy. It is an attitude. How do you be happy? Ask what it would feel like right now if you were happy. Ask yourself how a happy person would be. How would a happy person breathe…shallow or deep? What would their posture be like? How would they move? What would they be thinking? How else would they be? Once you have the answers to these questions, you have the formula to be happy. If you want to be successful… enthusiastic… compassionate, ask how a person with these qualities would be and be it by putting your attention on how it would feel right now.. You will find that once you develop these qualities, you will automatically do the things that will bring you the things that you desire. Always start your New Year’s Revolution by developing your be. Before taking action, spend a week, or even a month, being the person who would take that action by putting your attention on the feeling of it already accomplished. You will reach a point the feeling will be so real you will naturally the action that will bring it forth easily and effortlessly. It will be a natural expression of who you are. Just as a flower effortlessly releases it fragrant scent and a bird naturally sings its song, so too will you naturally fulfill your New Year’s REVOLUTION. Categories: Awareness | Tags: change, commitment, decision, new years resolution, success | Permalink. It is a time-honored tradition of yearly commitment to change – the New Years Resolution. We sit down and make a decision that this year we will begin a regular exercise program or new diet. Or perhaps we will quit smoking or spend more time with our children. Why is it that when we make these ‘resolute’ decisions, so many of these annual promises rarely last? When we resolve each year, what we are really looking for is ‘a dramatic and far-reaching change’. What we seek is a New Year’s REVOLUTION. Categories: Awareness | Tags: being, change, decision, diet, doing, exercise, goals, having, new years, new years resolution, success | Permalink. This Saturday my family and I are moving to our new home. Besides getting married and starting a new business, moving residences is probably one of the biggest changes one can have. Yet, when you have effective strategies for change, this big change can be made smoothly. One of the greatest strategies for change is applying the Triad of Change from the Reorganizational Healing model as discussed in an earlier blog. The Triad of Change encapsulates all areas of life and demonstrates what needs to be in congruence for change to happen. Structure – What we have – Home, Body, Business, Finances, Relationships, etc. 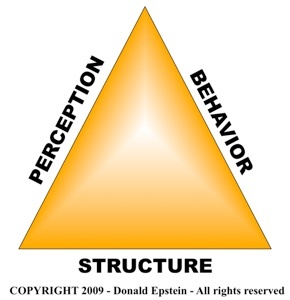 Perception – What we focus on – Our thoughts, feelings and the meaning we give things. We also discussed previously that when you have a challenge and/or want to create change in one of the aspects of the Triad, rather than trying to change that aspect, focus on the other two. So I’d like to use our move as an example and demonstrate how we applied the Triad of Change. You will see how common sense this strategy is. The change we wanted to make was in Structure – our Home. So to make this change we focused on Perception and Behavior. First, we made a list of all the qualities of our ideal home and how it would feel to be there. Every day, we would look at the list and really feel how it would be to live there….as if we were already there. That’s Perception. Then we took the appropriate actions (Behavior) to find the home. Got a realtor. Visited homes. Etc. Before we knew it, we’re packing and moving to our new home – Structure. That’s how it works and you can apply this to any area of life you want to change. Categories: Awareness, Health and Wellness, Network Spinal Analysis, Reorganizational Healing | Tags: adaptation, change, chiropractic, environment, healing, health, Network Spinal Analysis, Reorganizational Healing, Triad of Change, wellness | Permalink. At this point, the healing experience has become a very real and integral part of your life. It is no longer something that you desperately seek nor is it a new idea in your consciousness. Through all that you have experienced, you have come to realize that healing is not something that someone must do to you or the consequence of any specific action, therapy, or diet program, but is instead an aspect of life that never stops, never leaves, and is your constant companion. You no longer need affirmations to remind you of its presence, and you no longer must visualize your healing vision. These affirmations become your constant inner dialogue and your visualizations never leave your mind’s eye. You have read the books, you have studied the words, you have followed the instructions, and now it has become as familiar to you as breathing, eating, and sleeping. Healing is not something that somebody does to you, or even something that you do to yourself. It is merely something that you do, just as your heart beats and your lungs breath. You now understand, through your own experience and your daily increase of awareness, perception, and consciousness, that healing is not simply the relief of symptoms and remission of disease, but the constant process of growth, evolution, and learning. As your perception continues to become more refined, and your ability to respond more appropriately to changes in your outer and inner environment becomes more effective and efficient, learning and growing become more of your regular daily experience. You begin to more effectively manifest physically your intentions, more harmoniously interact with others, and experience greater levels of contentment, joy, and peace. Your disease, condition, or other expression of disharmony that once caused you so much distress, no longer holds a place in your consciousness and is seen as a consequence or effect of past causes (thoughts, words, and actions.) Instead, your consciousness is filled with your vision and you begin to witness the universal principles, which were once fantastic, and perhaps fictitious, concepts in your daily life. You have emerged into the Process of the Heart called Affirmation. In this stage of healing, your encounter with every moment of every day reminds you of and affirms the truths, principles, and laws that govern the universe. You no longer need to remind yourself of these things, for the universe begins to speak to you through life. As such, your language begins to change. You find that you no longer speak of lack or detriment, but instead spread only words of wisdom, healing, and truth. Your affirmations flow from you as natural as your regional dialect and cultural slang. You have freed yourself from the prison of false beliefs, denial, and doubt, and have become one of the few who sees through rose-colored glasses and always has a cup that is half-full, rather than half-empty. As you observe yourself in this constant state of affirmation and allow yourself to receive the voice of the universe through everything you see, everything you hear, and everyone you meet, you greet all experience with open arms and realize that we are all one. Categories: Awareness, Health and Wellness | Tags: adaptation, affirmation, affirmations, Awareness, change, evolution, growth, healing, health, philosophy, spirituality, wellness | Permalink.